Product #20718 | SKU LS-CT40MBK | 0.0 (no ratings yet) Thanks for your rating! 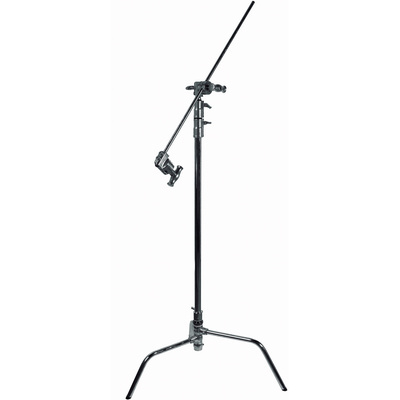 This Impact Master Century C Stand Kit (10.75') is comprised of a C-stand, 2.5" grip head and 40" extension arm. The stand features a patented locking mechanism that allows the legs to swing out and lock into place for easy setup and collapse flat for storage. The included extension grip arm fits neatly into the stand's removable 2.5" grip head, allowing you to offset the stand and cantilever flags, gobos or lights out of the way of the action. The stand has a low center of gravity which allows mounting of heavy equipment without tipping. The legs are perfectly shaped for saddlebag-type sandbags. The kit is also often used as a short boom. Fold-away, twist and release locking legs. Durable finish resists all weather conditions. Innovative design on the Century Stand base allows individual legs to be set at any angle, and can be positioned in locations not possible with classic stands. Ergonomic "T" shaped handles are "captive" -- they do not come off of the stand when unscrewed, preventing loss. Each riser section has an external rubber gasket, which protects your equipment and fingers from sudden drops in stand elevation.